This is an altered version of my traditional pie crust pastry (pâte brisée) recipe, with less butter (and more food processor). 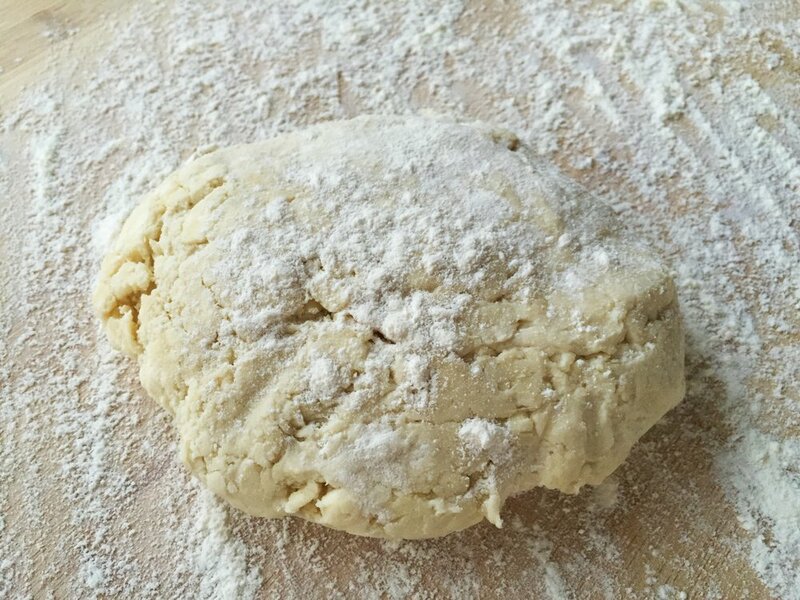 This version is designed to be a little sturdier and easier to roll out and handle, so that children and other beginners in my classes can learn the basics of handling dough without it falling apart or becoming too sticky for them to work with. It also works well in any recipe that demands a bit more durability from the pastry, such as Pumpkin Pasties. Visit People Like Pie, the cooking class that inspired this recipe, for more information on pie baking. Makes enough for two 9-inch pie crusts. Note: A food processor is preferred for this recipe. If you don’t have one, use the ingredients list for this recipe but follow the instructions for using a pastry cutter or your fingers in the recipe for Pate Brisee. Pie crust pastry, ready to roll. 1. Use the scoop and level method (see this page) to measure the flour and salt into the bowl of a food processor with a metal blade. 2. Cut the butter into small pieces and add them to the dry ingredients. Pulse about 12 times to break the butter up into smaller and smaller pieces until the mixture resembles coarse cornmeal, with very small pieces of butter, about pea-sized, still visible. 3. Turn the food processor on and begin to add the ice water in a steady stream as it runs. Only add as much water as you need to get the pastry to hold together. (You might not need all of the water.) As soon as the pastry begins to stick together in a large clump, turn off the processor. Do not over-process the dough. 4. When the dough can be pressed together, split it into roughly equal halves and transfer them each into Ziplock-type bags. Press down on the dough in each bag to form a disk (this will make it easier to roll out). 5. Rest the dough in the refrigerator for about an hour, or up to 3 days, before rolling it out (a longer rest will make it easier to work with). Dough can also be frozen for a few months.